​​SPRING 2019 Great Pyrenees puppy litter SOLD OUT! Visit our Great Pyrenees page for details on our Fall 2019 litter. 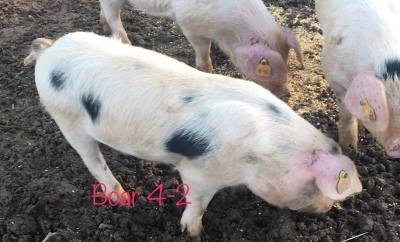 Only 4 more Old Spot piglets available, ready May 2019! Kiko & Nubian yearlings & kids available! Check our Nubian Goats & Kiko Goats pages for details. Gloucestershire Old Spots are a heritage breed pig, white with black spots, that produce delicious large portions of lean meat. They are great foragers and grazers with a docile personality. The sows are excellent mothers and great producers of large litters of piglets. The sows mature at a weight of approximately 500 lbs and the boars mature around 600 lbs. They likely originally came from an unimproved Berkshire and the Gloucestershire (a large off white pig without spots), both which are now extinct. It's exact origins though, are unknown. They were developed in Gloucestershire, England in the 1800's and according to British folklore, the black spots are the result of apples falling, causing bruising as they foraged under the trees. The breeds numbers fell after World War II and even more so in the 1960's, nearly becoming extinct, as pig farming moved in a different direction. Their numbers since then, however, have been slowly increasing. They were imported into the US in the 1900's but were nearly extinct here by the 1990's until the Kelmscott Farm Foundation of Lincolnville, Maine imported twenty piglets in effort to re-establish the breed. In 2009, there were less than 1000 in Great Britian and less than 200 breed stock pigs in the US. The support of the British Royal Family, who still favors pork from the Gloucestershire Old Spots to this day, is notable. We decided to raise this breed of pigs based on its disposition and its self sufficiency of being able to thrive on and raise piglets on pasture. We were however completely won over after tasting the meat for the first time. It was unlike any pork we had ever tasted. We have thoroughly enjoyed raising our pigs and look forward to many years to come raising the Old Spots here. Visitors that are familiar with the disposition of other breeds of pigs often comment on how unbelievable it is that our nearly fully mature boar and sow are both so calm and accepting of us being so close to them, let alone petting them. That is perhaps one of our favorite things though. To be able to spend a little time with them, perhaps even spoiling them ever so slightly. Our March 2019 litter is here. Reservations are being accepted now for feeders and breedstock. Please contact us if you are interested in reserving from this litter. We currently only have six remaining available from this litter of 13. *Registered breeders $350 ($100 deposit required). Deposits can be made via paypal or by cash, check, or money order. Please call to confirm availability before making a deposit. Discounts available when purchasing multiples. Contact us for more information. WE HAVE RAISED ONE BOAR TO BREEDING AGE. HE IS REGISTERED WITH GOSA AND IS NOW AVAILABLE. HE HAS GREAT CONFORMATION AND IS TRAINED TO ELECTRIC FENCE. PLEASE CALL FOR DETAILS. CLICK THE LINK ABOVE TO DOWNLOAD OUR PRICE LIST TO ASSIST YOU WITH YOUR FRESH PORK ORDER! Please call for availability as some items may not be available at all times. Or click here to be directed to the contact us page where you can reach out to us or join our mailing list. PLEASE CONTACT US TO RESERVE PASTURE/WOODS RAISED, USDA INSPECTED, NON GMO, SOY FREE, HORMONE AND ANTIBIOTIC FREE PORK TODAY. ALL PRODUCTS ARE NITRATE AND NITRITE FREE! We currently have a limited supply of ground pork, pork loin chops, sausage (mild, hot, and cajun), keilbasa, fat back, and pork belly! Call for quantities available and prices or come by the farm to pick up your fresh pork today!